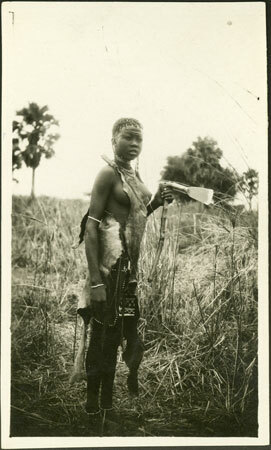 A full length portrait of a young woman posed for the camera holding an adze, wearing a goatskin and beaded apron. The format of this print does not match others taken by Evans-Pritchard, so it can be assumed that this is an image given to him, perhaps by C.G. Seligman. Note on print reverse ms pencil - "EP.M.80"
Morton, Chris. "Shilluk woman" Southern Sudan Project (in development). 03 Jan. 2006. Pitt Rivers Museum. <http://southernsudan.prm.ox.ac.uk/details/1998.348.20/>.